I love this title, don’t you? This is a story of the lowly breadcrumb. Most of us will attest to throwing out our share of old bread. It’s what we do. Bread is readily available and inexpensive compared to most foods we buy. In the past bread was handcrafted at home and therefore it was precious. Time had to be spent making this simple yet revered food. We’re not suggesting that you start baking bread so you can have breadcrumbs, rather we suggest that you can make something special out of an otherwise throw-away ingredient. Most of us will make a casserole at some point in our culinary lives and seasoned breadcrumbs can add a crisp, tasty topping that sends the ordinary to the stars. In southern Italy breadcrumbs were used by peasants in place of the heavenly Parmesan that was only produced in the north of the country. 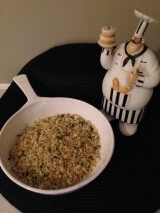 Toasted breadcrumbs, seasoned with fresh herbs have been scattered over pasta for centuries. We love to take our leftover bread and do two things that make us look like culinary wizards. First is our recipe for Seasoned Breadcrumbs and the other is our Garlic Croutons. We do not use sandwich bread for this recipe. We always incorporate good baguette, crusty rolls, Pita, Italian bread and so forth into our everyday meals. This is the type of bread that we like. We then allow it to dry on the counter overnight before running it through the food processor. Processed white sandwich bread is not a good option here. 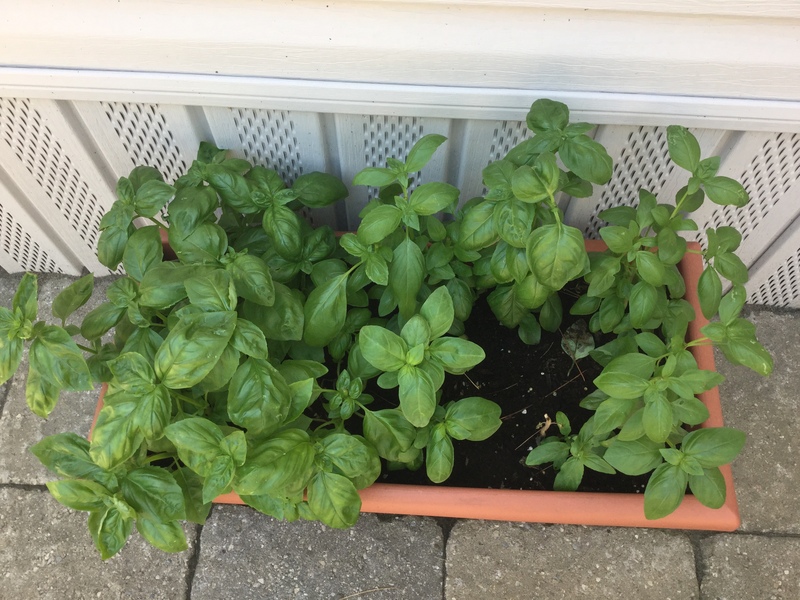 If you do not have fresh herbs, this recipe does very well with a good dried Herb du Provence or your own blend of rosemary, thyme, oregano and basil. Use 2 Tbsp only. Blend the ingredients together and incorporate well. We store our crumbs in a freezer bag so they’re on hand when we need them. 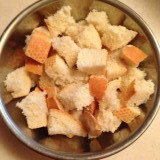 You can certainly make more crumbs if you have more bread or as we often do, buy a nice loaf of crusty bread for the sole purpose of making the crumbs or croutons. This way they can be pulled from the freezer and used immediately. Here we have used them to top some luscious tomato halves. 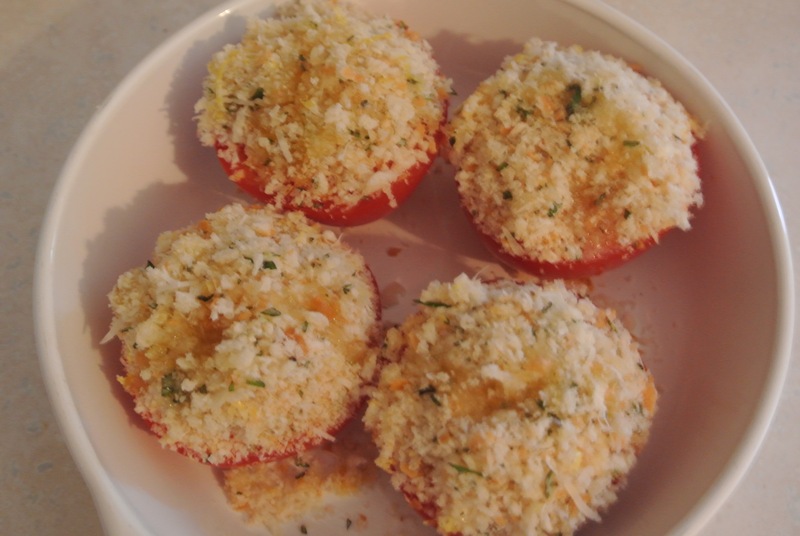 They are baked in the oven but can be cooked on the BBQ as a side dish to any meal. Just place them in an oven proof or foil dish. 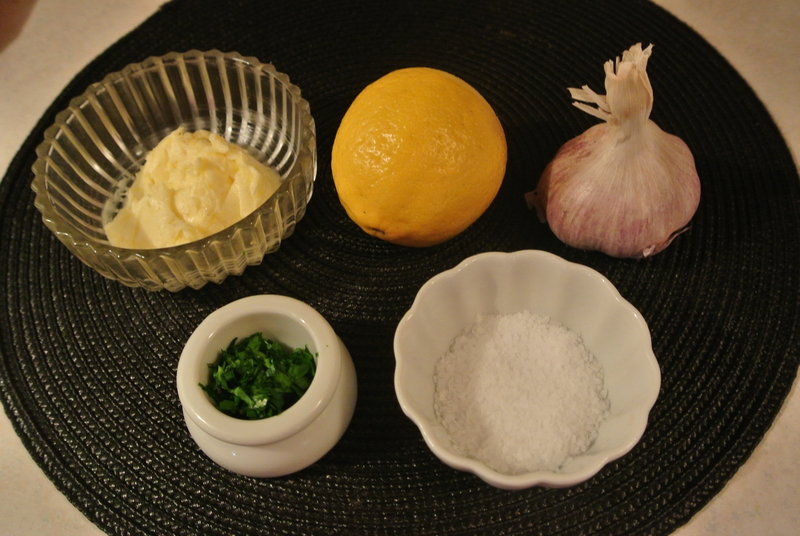 You can garnish a casserole with this topping as well. 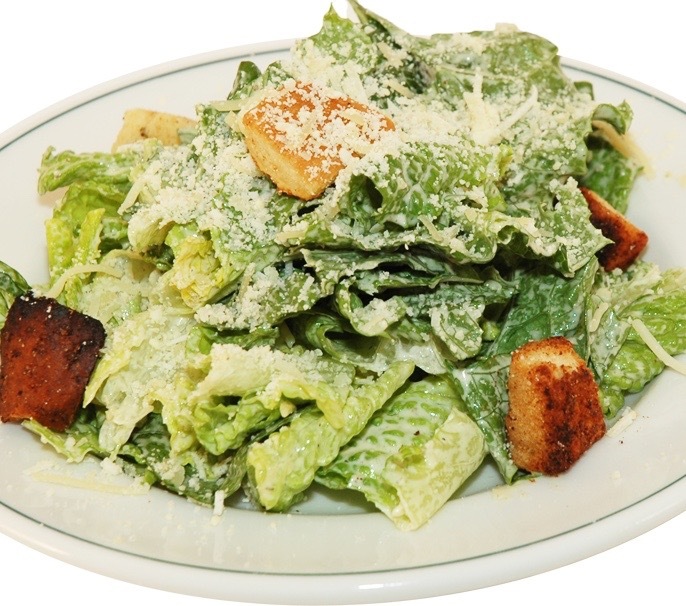 We love these Croutons with a good Ceasar salad. They’re particularly good when made with Portuguese buns. They come out light as air and the end result is crisp outside but soft inside. Mmmmm. 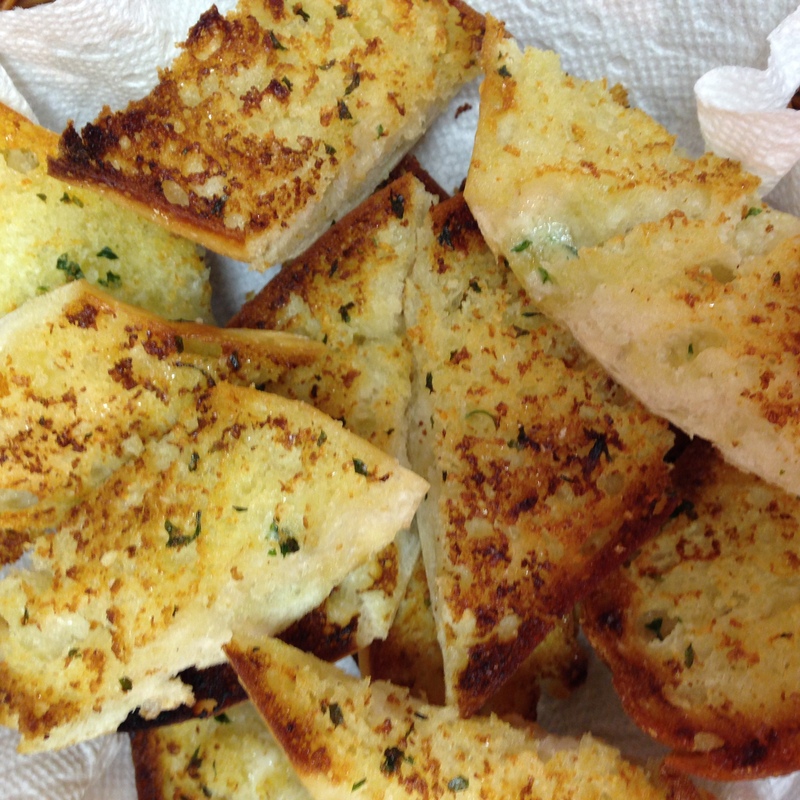 Place bread cubes into a non-stick pan and drizzle some good olive oil over the cubes. Just enough to moisten then. Now toast in the pan over medium high heat. Stir gently until they are golden brown. Stay focused, because one minute they are white then they’re done. It’s almost impossible not to eat them at this point, so always make a few extra for the chef. We hope you’ve enjoyed the first of our “Waste Not, Want Not” blogs. If so, tell your friends on Facebook and Twitter by sharing this post and don’t forget to leave us a comment about the post. 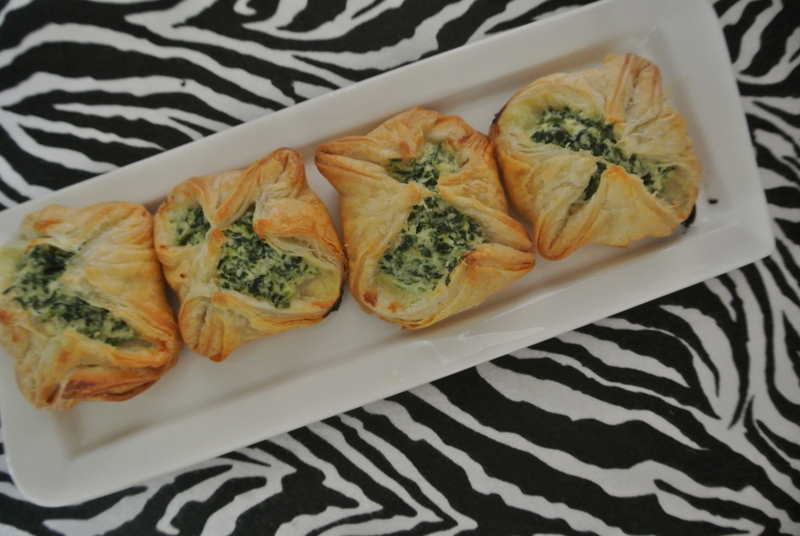 The Busy Hostess Loves Spinach Puffs! Harry and I love to entertain, that’s not a secret. We enjoy preparing interesting meals that introduce our friends to the world of food as we see it. Time is often the one thing that keeps people from having dinner parties more often. We found a way around that. We do what is called a “Cottage Supper”. When we invite friends for a “Cottage Supper” its understood that the food will be simple, interesting and wholesome. They love it! One of the things that buys the cook a bit of time when company comes, is the appetizer course and we do love our appetizers! However, we don’t like to fuss a great deal in the preparation. This is where our Spinach Ricotta Puffs hit all the marks. It’s easy, it can be made ahead and frozen till the guests are in the driveway and it tastes so good. 1 sheet quality frozen puff pastry dough. 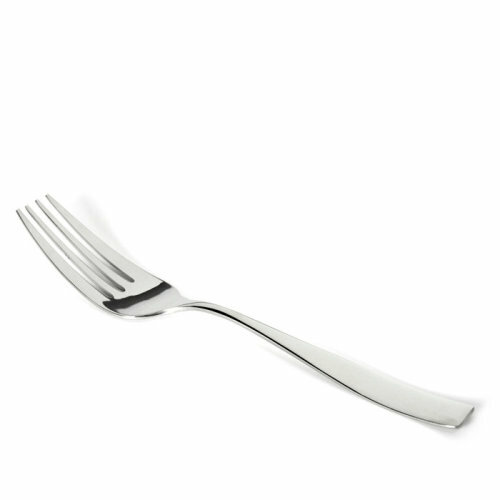 We use this because you simply can’t make it any better at home and it takes an entire day to make. We said this was easy right! Allow the puff pastry to thaw and unroll it. The type we use is PC brand. It comes in a sheet that is rolled and ready to use. In the meantime, mix the cheese and spinach filling. Place all the ingredients except the puff pastry into a bowl and blend together. Once the dough is thawed cut it into 9 equal squares. (the dough should measure about 12 inches square when unrolled). In each of the small squares of dough place an equal portion of the filling. Now gather the corners of the small puff pastry pieces to the center and pinch them together. At this point you can freeze the pieces, ready for your next party or you can refrigerate them for baking in an hour or two. Puff pastry dough performs best when cold dough is placed in a hot oven. It causes the layers to really puff. We use a 400 F oven to cook anything with a puff pastry cover. In this case you need only 15-20 minutes of baking time. Keep a close eye on the oven at the 15 minute mark to be sure the puffs are not getting too brown. 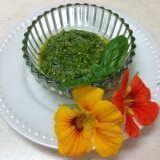 We love to serve this appetizer when we do an Italian dinner. The flavors of the meal and the appetizers compliment each other nicely. Tell your friends and family about our blog so they can enjoy our style of cooking and entertaining. Like us on Facebook or share us! Rhubarb Custard Pie! Oh My. 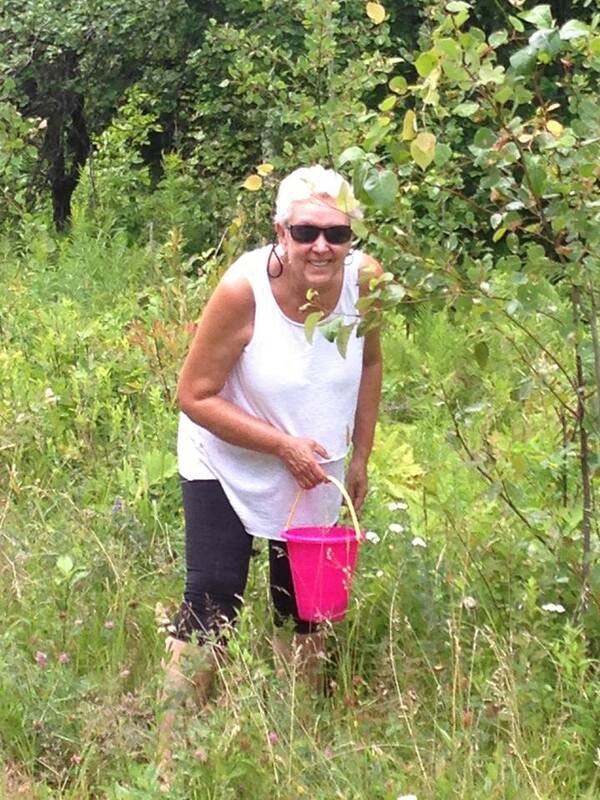 Rhubarb is best picked in the Spring. Once the middle stalk bears flowers the fruit is no longer used. 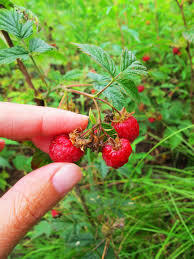 The window of opportunity is very short but the freezer can help extend the season for this highly under-rated fruit. 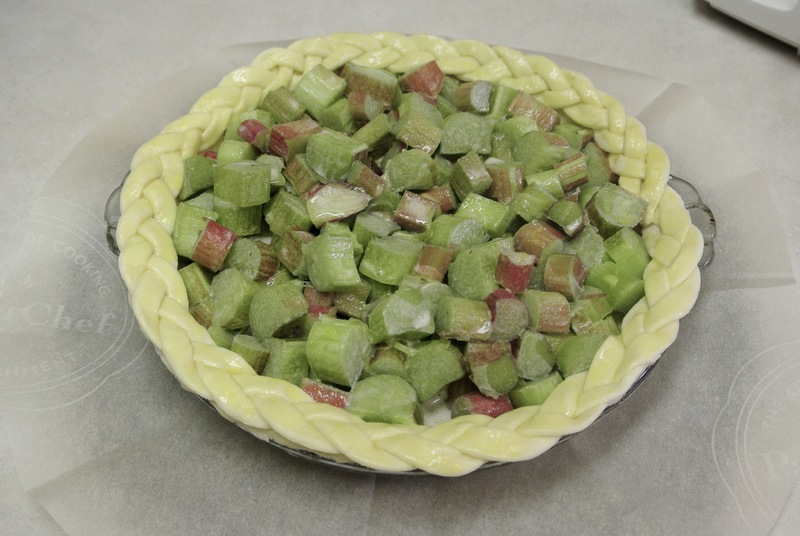 We love to make this pie throughout the year so we harvest the rhubarb and freeze it in portions for a single pie. Simply wash the stalks and cut into 1/2 inch pieces. Tuck into freezer bags and you have fruit throughout the year. We use a standard pie crust for this recipe. Either a lard or butter crust will do. You can even use a quality frozen pie shell if the need arises, but we always prefer homemade if time allows. Mix 3 large eggs with 1 & 1/4 cup sugar and 1/4 cup all purpose flour. Blend well. Grate in 1/2 a nutmeg or use 1/2 teaspoon ready grated nutmeg. Fresh grated is best! 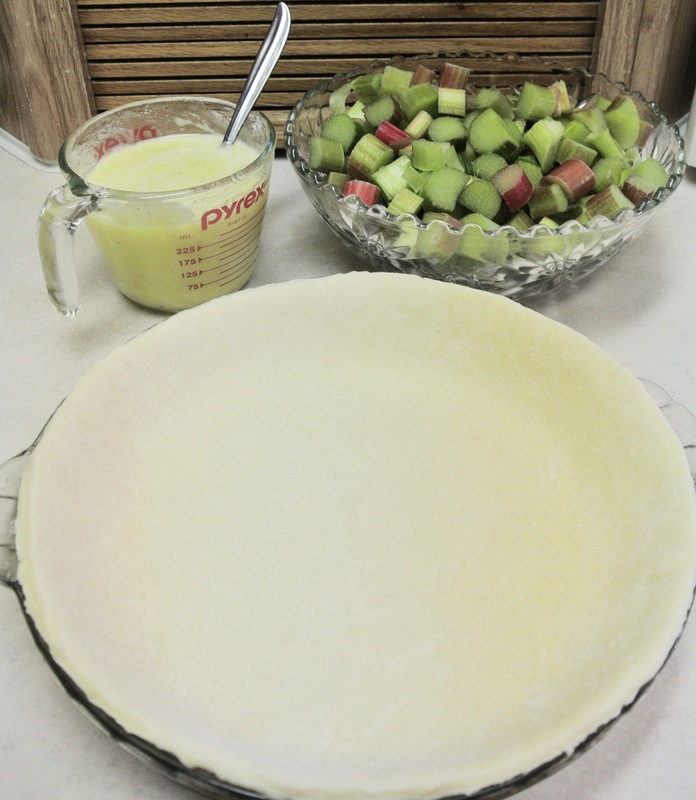 Pour the egg mixture over the fruit, create a nice edge for your pie with left over crust. Beat 1 egg in a small bowl and brush it on the crust to glaze. Bake at 400 F degrees for the first 20 minutes, then reduce the heat to 350 F for the remaining 40 -45 minutes. The pie should still have a slight jiggle to it and the crust should be a rich golden brown. Set on a rack to cool, then refrigerate before serving. We do like a good topping of freshly whipped cream just to “Guild the lily”! We made a braided edge and egg-washed it to the pie crust once it was filled. 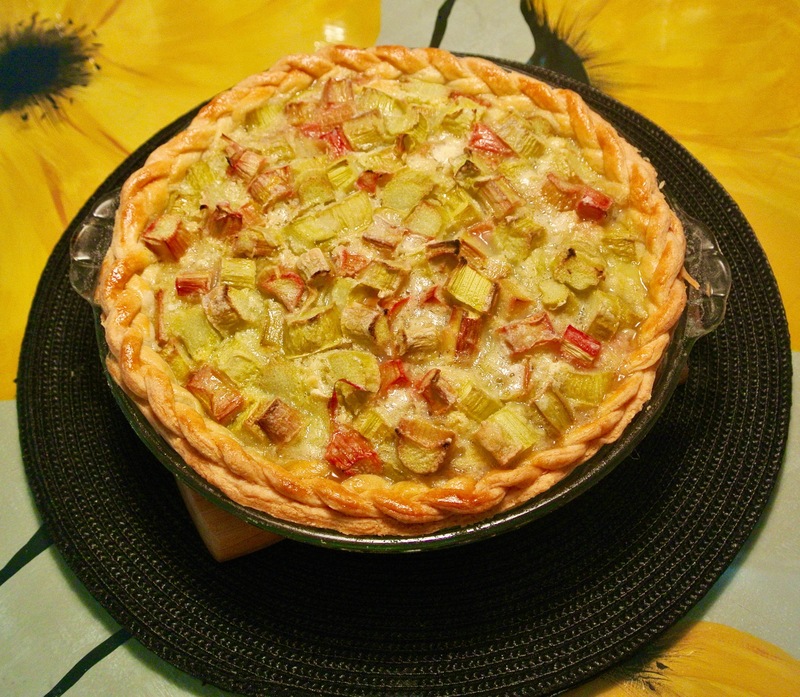 We hope you enjoy our version of Rhubarb Custard Pie and that you share it with your friends on Facebook and Twitter. Your comments are always appreciated so please use the handy form below! Enjoy. 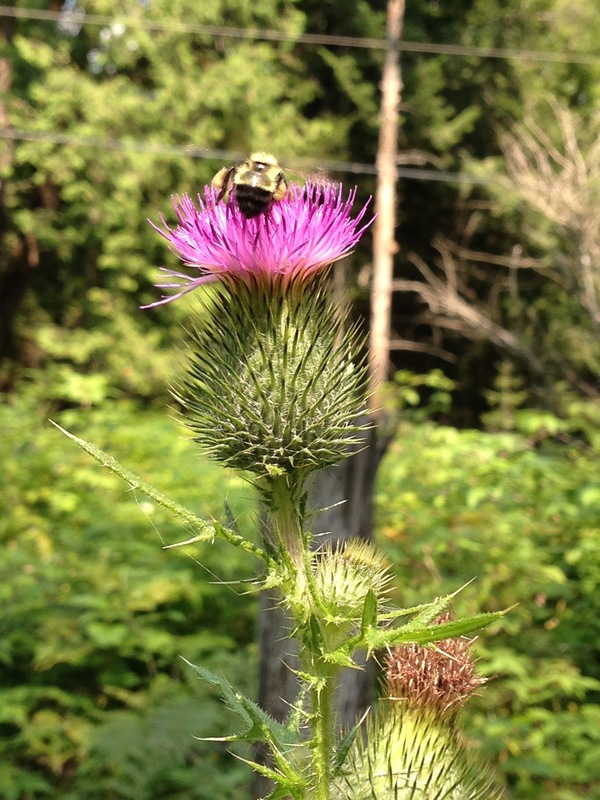 We were able to capture this beautiful image of a bee collecting pollen for the next batch of Honey. Had to share it with you! Dessert under 300 Calories? Yes! Who does not love to enjoy something sweet after a meal, or as a treat all by itself? The problem is the calorie count usually creates guilt. We live in a world of plenty and that has gotten us into some trouble with our waistlines, but you are going to love this beautiful, sweet and low calorie dessert! 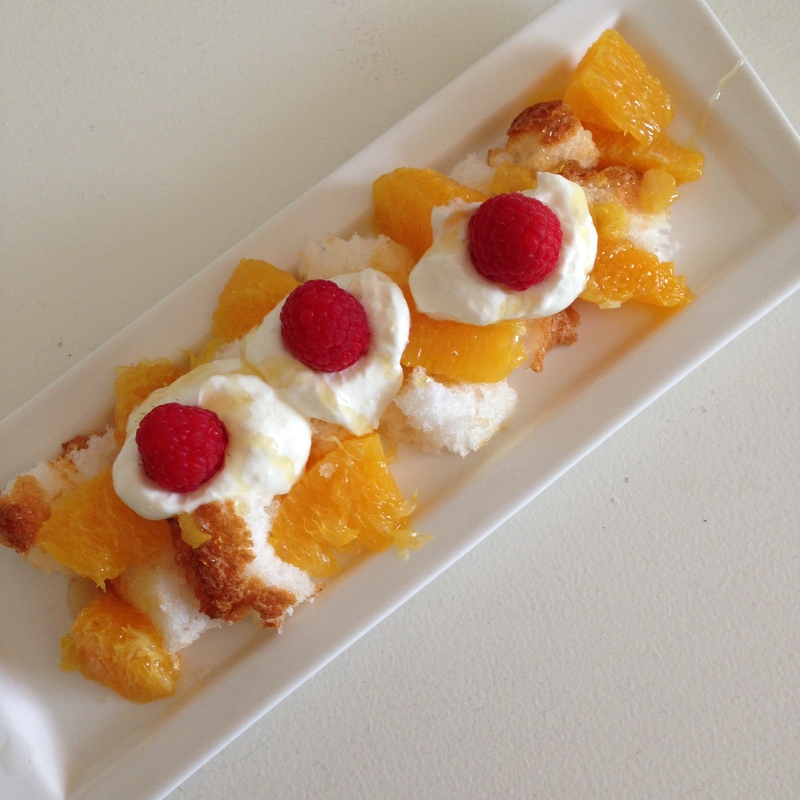 Not only is this dessert delicious and low calorie, it’s so easy to make and its also versatile. We had a store-bought Angel-Food cake on hand. We also had a can of no sugar-added mandarin oranges some Greek yogurt (lemon flavor) and a few plump berries in the fridge. It took about 3 minutes to make the dessert. 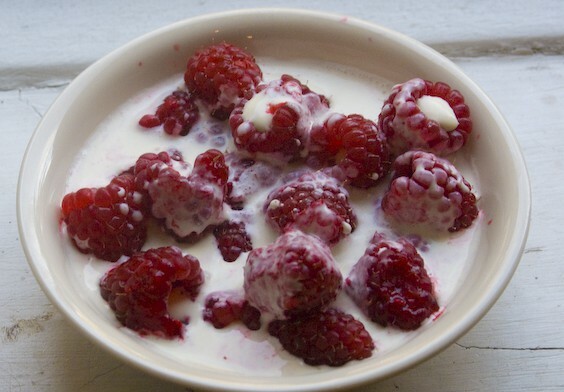 By eliminating the sugar and substituting yogurt for whipping cream the result is sublime! Tear cake slices into bite-size pieces, arrange on a plate (Use 1/12th of the store-bought cake per portion) calorie count for 1 slice of cake. decorate with a few berries or perhaps some Pecans! Now sit back and savor ever morsel of this fresh-tasting, miracle of dessert! Its about the same calorie count as 20 potato chips, but so much more satisfying. You can substitute any soft or juicy fruit. Strawberries are particularly good with Angel Food cake, but summer peaches would be lovely topped with fresh blueberries too. Grate some lime peel on top of fresh mango. Be a bit creative, use other yogurt flavors too. Tell us what you did to create your own version of this dessert! We’d love to learn something new from you! 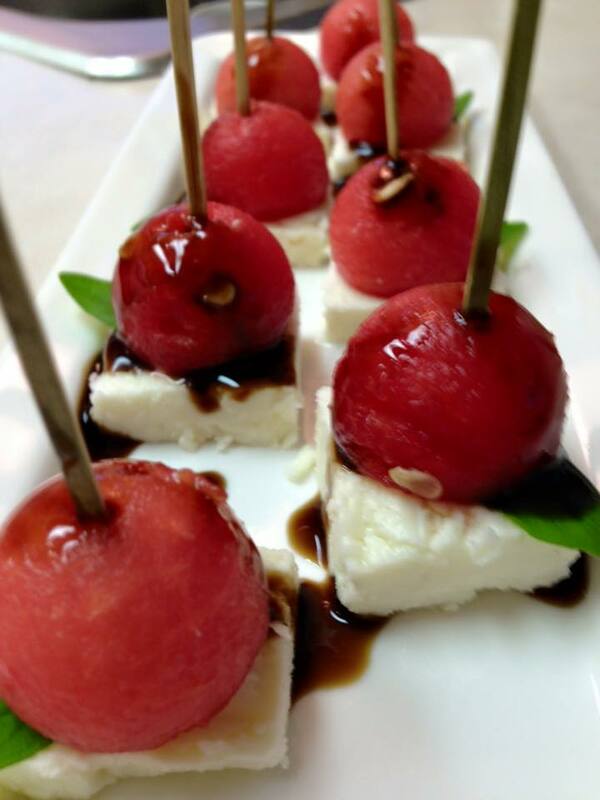 Watermelon and Feta Cheese Appetizers. As the temperature hits 30 degrees its time to turn off the heat and find ways to savor the flavor of Summer. What is more quintessential than Watermelon? Paired with Feta cheese and you’re sure to make a lot of people happy. Just looking at these little bites is enough to make you feel cool all over. 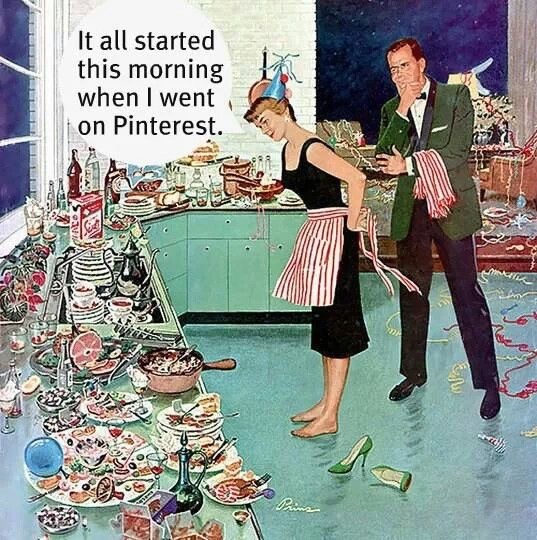 The best part is the ease of preparation for a busy hostess. 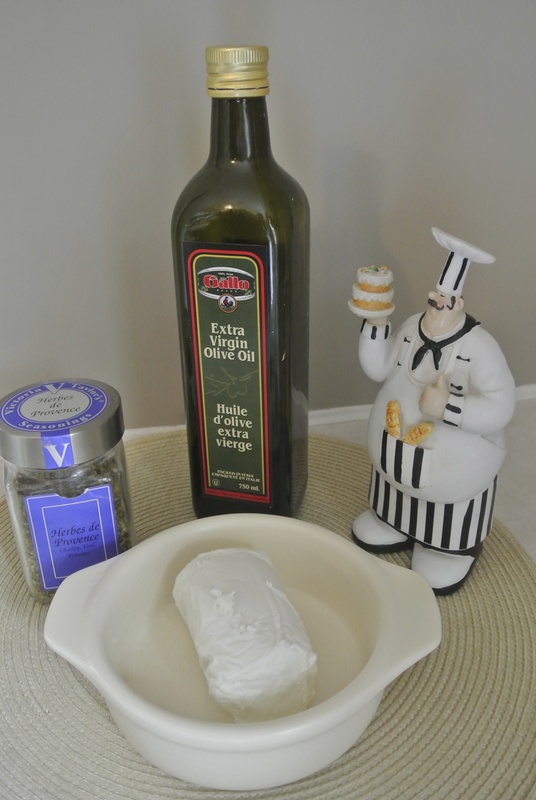 I brick Feta cheese ( you can go low fat here without sacrificing taste)! Cut the watermelon in half and scoop out balls with a melon-baller. Cut the cheese in generous 1 1/2 inch pieces about 1/4 inch thick. Place cheese pieces on a pretty serving tray, add the tiny Basil leaves, top with a watermelon ball and skewer it all together with a decorative pic. All that’s left is to receive the compliments when the guests take their first bite! Cook’s Tip: There are great little shops in most towns that specialize in fine Italian foods. We love to go to the St Lawerence Market or Kensington Market in Toronto, but Little Italy also provides great stores featuring Italian products. We just love the Balsamic that we found in one of these places, we just can’t remember which one! There are also fine Balsamics infused with Raspberry or Figs that would work equally well in this recipe. Be brave, try something new. 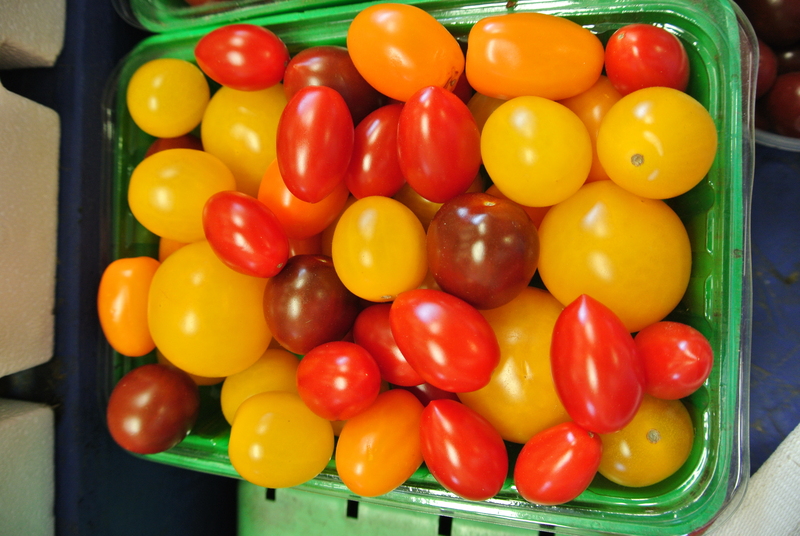 Any time of year is a great time for Grape or Cherry Tomatoes. During the cold winter months tomatoes leave a lot to be desired in the taste department. They tend to be hard orbs without the color or taste of a vine ripe tomato. To the rescue the glossy red or yellow Grape or Cherry Tomato. 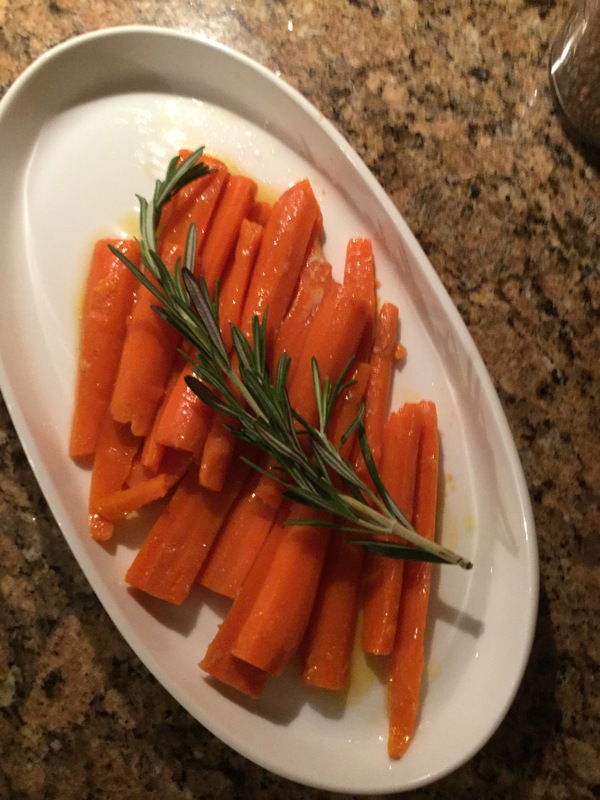 This recipe captures the sweetness and amps up the taste with the help of fresh garlic and Rosemary and a quality olive oil. If you want a subtle twist to this recipe, try a good splash of flavoured Balsamic vinegar such as fig or truffle before roasting the tomatoes. 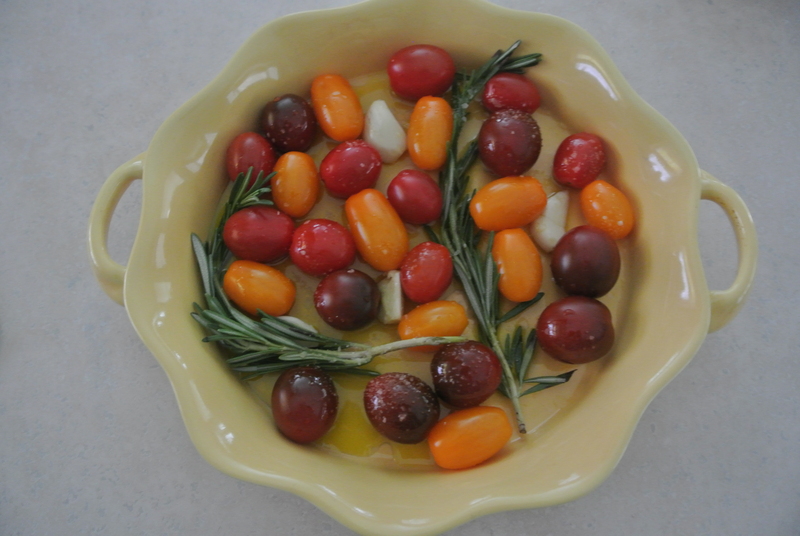 In a shallow oven-proof dish, spread the tomatoes, rosemary and garlic slices. Add the sea salt and pour over the Olive oil. Place in hot oven. You will smell the tomatoes once they reach the stage of perfection. Make sure the skins are starting to burst and they will be ready. Set aside until they cool. You can now use them with a savory cheese side dish as an appetizer, or as part of a light sauce for your next pasta dish. We use them in many of our Italian recipes. 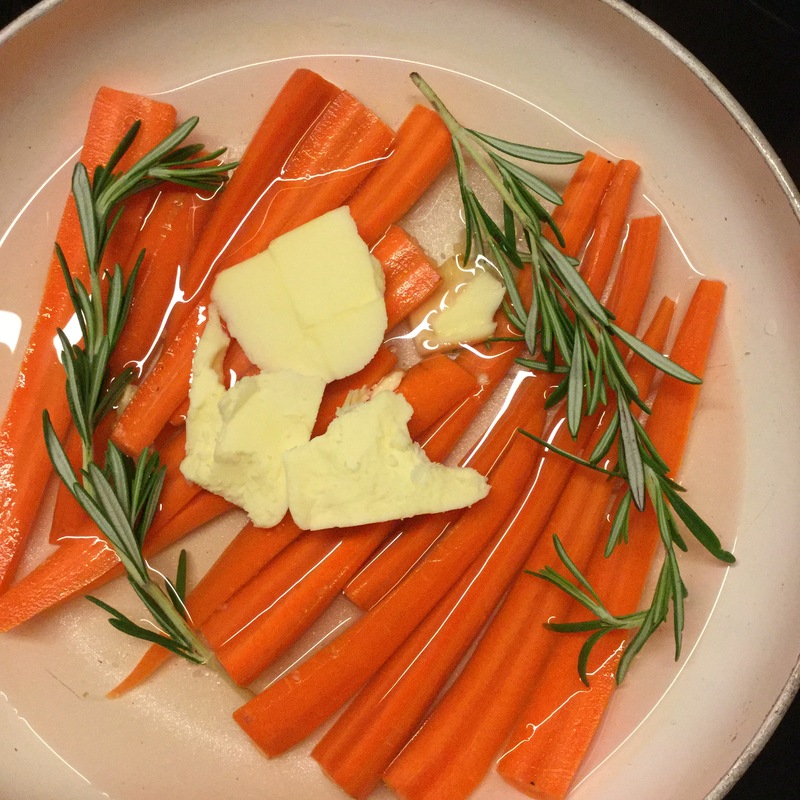 Watch for more ways to use this ingenious little dish right here on the blog. 1 small tube of goat cheese (about 4 ounces) at room temperature. 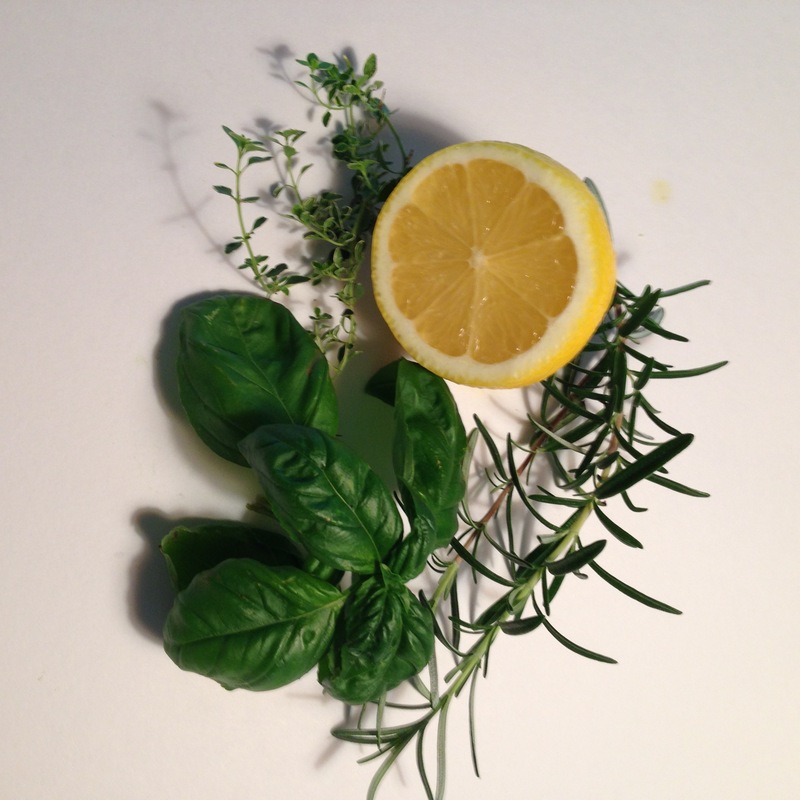 1 tbsp Herb de Provence This herb mixture is available at most grocery stores packaged under a variety of brand names. As long as it is fresh choose the one you like. Blend all ingredients in a small bowl. 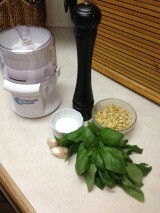 Let rest for an hour or so to allow the herbs to infuse the cheese. 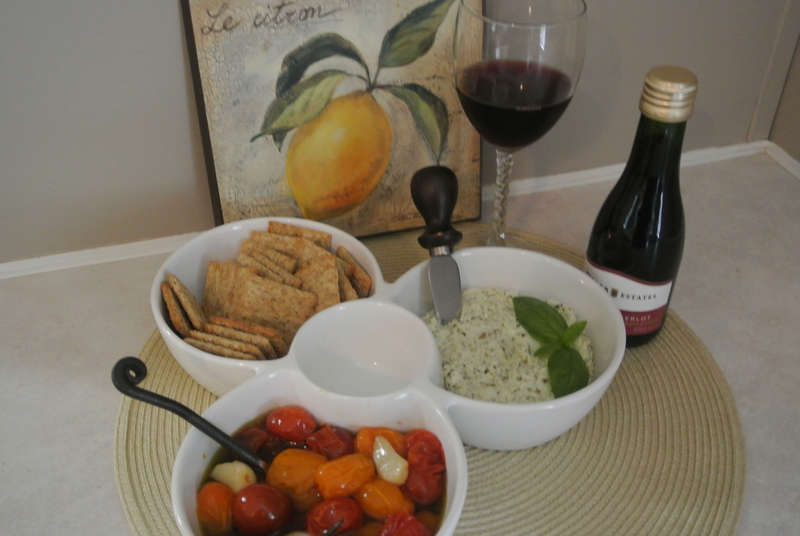 Serve by spreading on your choice of crackers and topping with a roasted Grape or Cherry Tomato. We love Rosemary and Olive Oil Triscuit Crackers! This is one of our favorite go-to appetizers when we have a garlicy main dish on the menu. It’s easy to make a day ahead and keeps for several days in the fridge. We prefer to allow the tomatoes to be room temperature when serving. It lets the flavors shine. 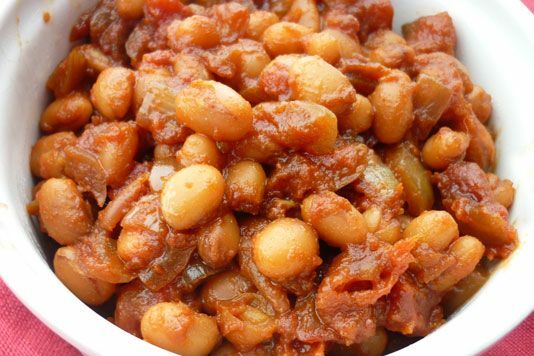 Let us know if you tried this simple yet tasty dish. Share this recipe with frineds and family on Facebook if you enjoyed it!